Putting a fresh look on this Duncan Phyfe style sofa shows how folks can up-cycle vintage furniture. 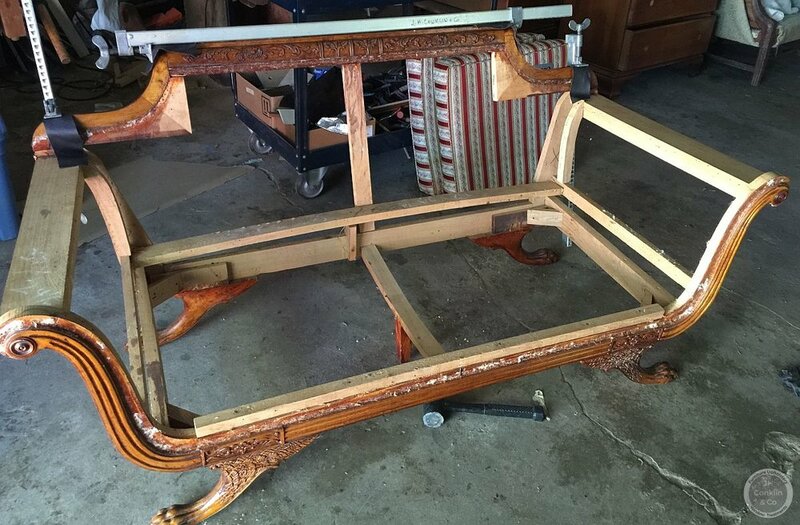 Ever wonder what goes into a complete upholstery makeover? Browsing through the steps of this project shows the major stages of deep reupholstery. If you prefer a video format, watch it below. Or scroll down for the longer story. This Middletown, Delaware couple wanted a small sofa that didn't look like a love seat. New pieces looked too heavy for the room. Knowing they wanted a custom look, they dug around for vintage pieces. And found this small Duncan Phyfe style sofa at a garage sale. While researching upholstery options and fabrics, they stored the sofa in their garage. Opening the garage on a warm, damp day they discovered a nasty surprise. Aromatic cat urine, wafting out from the sofa cushions and fabric! But, the sofa was slated for re-covering anyway. Not-a-problem. Notice how the seat cushions above slope down to the center? We noticed it right away - symptomatic of loose springs or saggy webbing. Support webbing torn and pulled from the frame lets the springs collapse. Slack and broken spring cords lets the springs turn sideways. Digging a little deeper into the foundation and padding, we found the cat urine had soaked more than the cushions. But the old foundation had to be replaced anyway. So Jim removed all the upholstery down to the wooden frame. The rest of us kicked him outside in the breeze. The cat and the dust! Too much! Wobbly joints in the back tightened with new dowels and glue. The original wood finish was wrong for the new look. After cleaning it, Matt prepares for the layers of bonding primer and lacquer for a new finish. With a dedicated area for finish work, we regularly change, refresh or replace frame finishes. (See some finishing examples here) For this project, Matt lays out the first of two coats of satin black lacquer. All this activity and only now moving into the upholstery shop! Applying new support webbing to the frame sets a stable platform for the springs. Laying out the springs before attaching them to the webbing sets the shape (and function) of the new deck. The springs are cross-tied to one another and anchored to the frame. This compresses and stabilizes them, allowing them to work together. Then, a layer of burlap keeps the springs from cutting into the foam and Dacron padding to follow. A thin layer of foam softens pressure points from the springs and frame. A black velvet forms the outer layer on the newly re-built deck. You can see the Dacron plush over the foam on the sofa arms. A black and white paisley print fabric completes the sofa body upholstery. First, the insides. Then the outside arms. Finally, the outside back panel finishes the major upholstery work. 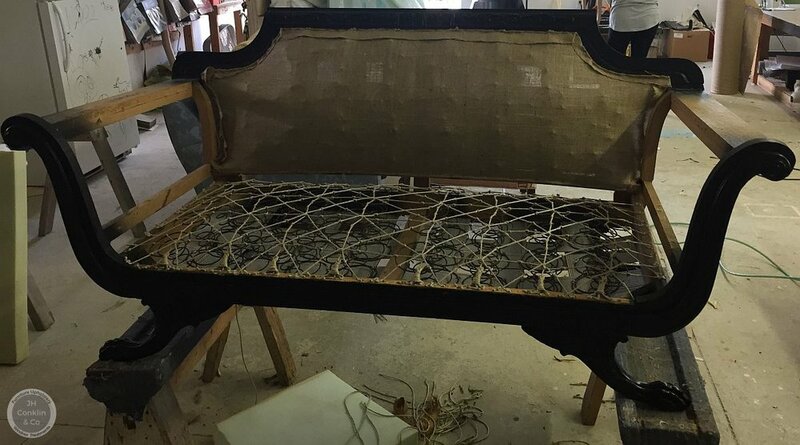 Double cord welting around the cut edge of the fabric along the frame gives a clean finished edge to the upholstery. On this project we used the paisley fabric for the cording. Meanwhile, we made a single high-density foam cushion to replace the soaked two-seater cushions. A single cushion gives a wider impression. Wrapped in Dacron plush and covered in an eye-popping acid green micro-fiber fabric. Now THAT has my attention. Right? Delivering the completed upholstery project to Middletown, Delaware was a blast. Our client gave us a photo from the internet to use as a style guide - and we ran with it. From retro-to-metro. A vintage styled sofa completely at home in a contemporary setting.